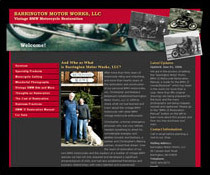 Barrington Motorworks, LLC, Vintage Motorcycle Restoration Service company in Barrington, NH sought our help to revamp their webside with a whole new design and functionality that would allow them to sell their restoration manual book, manage their site content and galleries. After integrating their site to PayPal that allows them to accept credit card payments online when customers order their books, they've been selling their books quite successfully. After just one month of adding the ecommerce functionality, they sold 300 copies of their books. This is our most successful redesign project. The whole new design and branding plus the programming development efforts resulted to tremendous returns to our client, who has been continuously receiving new orders of their restoration manual book. Here is a list of some of our clients although this is not a complete list. We are serving locally in Palm Harbor FL, Clearwater FL, Seminole FL, Oldsmar FL and throughout the Pinellas County and Hillsborough County such as in Tampa FL area as well as in Orlando and Kissimmee FL. This includes Los Angeles CA, Los Gatos CA, Portsmouth NH, Rochester NH, Cambridge MA, and other states across the United States including Great Britain in Europe. This computer provides computer repair, security, and networking services in Tampa Bay FL, Clearwater FL and throughout the Hillsborough County and Pinellas County. This is a website redesign project. The owner wanted to revamp his company site with a new look and feel that would compliment his company image and other marketing materials. This is a business networking company in Los Angeles, California (CA). The site's back-end application wasn't working properly and needed a lot of improvements including design enhancements, and the database had to be cleaned up. This is still an on-going project. Most of the required tasks that the client needed have been completed, but this site will still need more work to improve its performance. Located in Los Angeles, CA, "Suzannah Galland is a much sought-after Life Coach who works with leading actors, high profile executives and entrepreneurs in the entertainment and media industries." We provide site maintenance and technical support to Suzannah Galland, and her site is undergoing some improvements. Her blog, especially, is being converted to WordPress. Work on this site is an on-going effort to meet client's needs. This is a pet couture company located in Los Angeles, CA. The owner, "Jake Dynnis has a unique role in Hollywood – she is the “Dog Tailor to the Stars”TM, the title in which was granted by the Hollywood Foreign Press Association and In Style Magazine." Her clients include Paris Hilton, Demi Moore, Ashton Kucher, Jessica Alba, Jessica Simpson, Tori Spelling, and Paula Abdul. Those are just a few of the list of "celebrities that own her unique line of pet couture". We provide site maintenance and technical support to Jake Dynnis. We've been working also on improving her e-commerce functionality since her site allows customers to purchase her pet couture products. This site is an on-going work to meet client's needs. This site will eventually go through some redesign and other improvements. This is a Marine insurance company for yachts with offices from Maine (ME) to Florida (FL). We provide site maintenance and technical support for ISRYACHT.COM. When we took over the maintenance of this site, it had experienced some security issues. We evaluated the problem and resolved the issue. This is a natural herb company located in Portsmouth, NH. The natural herbal products this company carries are intended to treat women's intimate issues. We provide our site maintenance and technical support services to Helen Rollins, who is the owner of this site. We've improved and resolved the site's readability, functionality, download speed issue, and shopping cart problems the owner was having. We also added the SEO URL address plugin to convert ZenCart's long addresses of the site that get generated. Here is a list of some of our continuing clients. We provided them our front-end web design and back-end web application development services. We also do maintenance to the following sites when needed. Discover Los Gatos is an informational site for visitors who are insterested in finding out where to stay, dine, shop, what's around Los Gatos, CA. It's an online directory where businesses such as wineries can advertise their products and services. We did not originally design this site. When we took over the maintenance of this site, we made improvements on the design, front-end and back-end funtionality. The LeadsReport.com is one of our highly successful websites and one of the biggest projects we've worked on. The company is located in Berwick, Maine (ME). We streamlined the site with an improved front-end interface design and functionality to strengthen the site's branding and marketability. We improved the client's business operation by using a dynamic database-driven content management system that we custom built to meet his specific needs. In addition, we built an ecommerce application to allow customers to buy subscription service for advertising construction development projects. We integrated the site with authorize.net payment gateway with automated recurring billing capability. This is another construction related website that allows contractors to bid for construction projects. The company is located in Gulf Breeze, Pensacola, Florida (FL). We improved the site's front-end interface design and functionality to strengthen the site's usability and appearance. We finished and improved the site's existing dynamic database-driven content management system which was incomplete and was not working properly when we took over the project. We also integrated the site with PayPal payment gateway for online payment processing. This is a consulting company in Cambridge, Massachusetts (MA). This is an education consulting company in North Shrewsbury, (UK) United Kingdom. We've provided this company our services in Educational Software Development, Technical Support, and Web Hosting support. We custom designed this website for Mary Lynn Farivari who's is a registered dietitian and author in Bethesda, Maryland (MD) in conjunction with the release of her book. We integrated the front-end design to WordPress to allow her to post blogs and maintain her site content on her own. We also integrated this site to PayPal payment gateway to allow customers to purchase books online. We custom designed this website for Dr. Jim Bloomer in Exeter, New Hampshire (NH). This is an informational website intended for Dr. Bloomer's patients and propective clients who might be interested in his type of primary care services. This site is encrypted to provide a secure online transmission of patient information and payment. We also integrated this site to PayPal payment gateway to allow patients to pay their balances online. We custom redesigned this site to replace the old one for this company in Nottingham, NH. The redesign efforts were to compliment the company's print advertising materials and to promote their air quality services on the web. We custom designed both eileenbehan.com and fortheloveoffood.org for Eileen Behan in Rye, NH. The EILEENBEHAN.COM site is an informational site that features Eileen Behan as a nutritionist and author. It contains information about her books and where to purchase them. It also provides information about her seminars, TV appearances, recipes, and book signing events. The FORTHELOVEOFFOOD.ORG is integrated with WordPress and Recipe Web Application. This enables the client to post blogs, update site content, and post 100 best fruit and or vegetable recipes. This online recipe site also allows visitors to share their recipes. This site was also set up to accept newsletter subscription. We custom designed this website to replace the previous website for Dr. Amy D. Pruszenski, O.D. of Portsmouth, NH. This site is intended to "serve patients suffering with learning-related vision problems"
We upgraded the existing WordPress to the latest version, integrated it with a new design, installed new plugins to add new feature which replaced the previous ones that weren't working properly in order to enhance the usefulness of the site and to meet client's needs. We also equipped this site to handle newsletter contact list and email marketing. We set up html email to strengthen the center's branding identity and professional image in connecting with their subscribers. This is a website for both the assisted living facilities in Dover, NH. We converted this website from its original Joomla content management system to our own custom content management system solution, which the owner and his staff found easier to use than the Joomla CMS solution. The owner sought our help, because they had a hard time using Joomla. The CLOBECA CMS solution we offered them was customized to meet their specific needs, so they could maintain the content of their site easily. This is a closet design company in Portsmouth, NH. We've continuously provided our site maintenance service to this company by making many improvements and updates to the site's front-end interface design and functionality. We also provide website design and web development services to the owner's other businesses. We custom designed and developed this networking website for Dr. Amnon Aliphas who founded this company for the "purpose of facilitating the process of entrepreneurship for the high-technology community." This company is located in Newton, Massachusettes (MA). This was a custom web development project for One More Referral, a business networking group in Dover NH with chapters in Portsmouth NH, Rochester NH, and York, ME.NH. We designed, developed, and programmed the web application functionality and features of this website, which we equipped with database driven content management system, and dynamic photo gallery application. This website allows each business member to sign up and add their business information including their company logo, and photo, which will be reviewed by the membership panel. We custom designed this site for David McCue, MSW, of Rye, NH. He wanted a web site presence to promote his psychiatric counseling practice in the Seacoast area with the look, feel, and mood that reflect New England's mise en scène. This site contains useful information for visitors, clients, and prospective clients about his psychiatric service, driving directions and maps, contact form, and others. This is an insurance broker's web site that we custom designed to compliment her print advertising materials, to highlight and promote her insurance services: health, life, disability, dental, Medicare Supplemental Insurance, and more. This informational website that we custom designed is for a local Dover, NH independent company that produces ja-da coffee and tea "mouth" pouch products. This is a dance studio in Rochester, NH that teaches jazz, tap, ballet, country clogging, and acrobats for children and older students. They needed a simple website presence after 50 years in business to display photos of their showcases, information how to contact the company and their studios. This is a custom web design poject we did for a company in Rochester, NH that provides "clients with museum quality art reproduction, digital imaging, and restoration services". Since the owners wanted to update the site on their own and didn't want a database driven CMS (Content Management Systems), we showed them a way of updating it using an online editor. We tailor designed this web site for scientific advisors (biological scientists, chemical, mechanical, electrical and computer science engineers) who provide consulting services to inventors, investors, and other firms. One of the challenges in this project was creating the exact logo to establish identity.